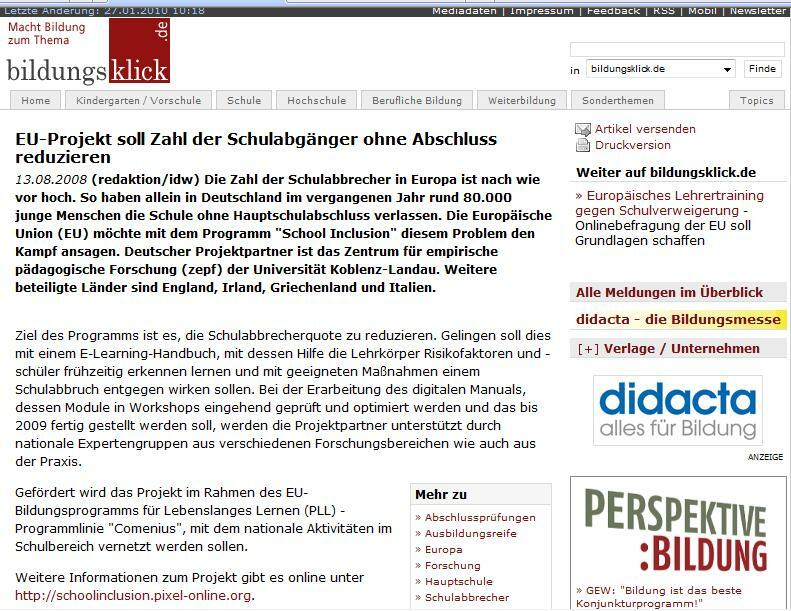 Several articles were published to promote the School Inclusion project. Pixel Associazione Coordinator of the School Inclusion project, Pixel is a training institution based in Florence (IT). Every visitor exploring Pixel’s project web site may access the School Inclusion Portal by direct link. C.I.P.A.T. CIPAT is the promoter of the Project School Inclusion. CIPAT is a consortium of 41 Tuscan Upper Secondary Education Schools, most of them Vocational Institutes. 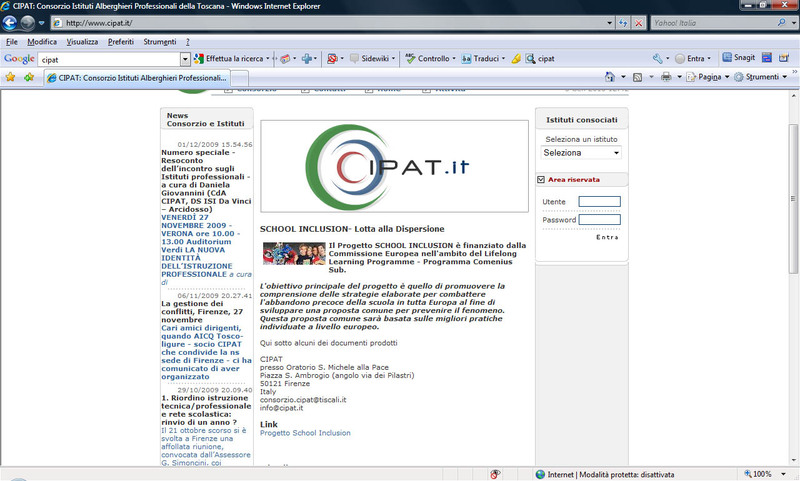 The homepage of CIPAT refer to the School Inclusion project and has a direct link to the project portal. 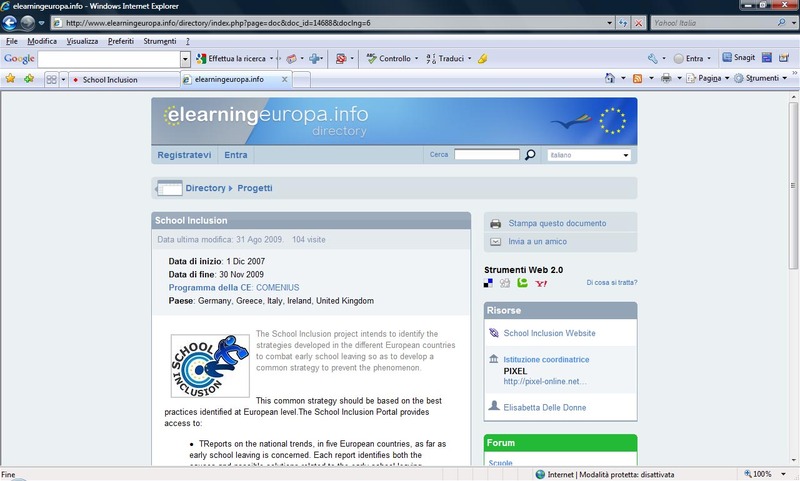 Elearning Europa.info This online community contains many information about elearning. It published detailed information about the School Inclusion project. Counselling Centre of the Christian youth help KOMM offers consultations, clearing and if necessary support in difficult situations related to absenteeism from school. It´s a counselling centre for children, young people, parents and teachers. Istituto Leonardo Da Vinci The Vocational School Leonardo Da Vinci temporary website posted a link to the School Inclusion portal under the paragraph “particularly interesting websites”. ZEPF ZEPF is the German project partner. It the pivotal research institute of the University Koblenz-Landau, Campus Landau. ZEPF website contains a full detailed presentation of the School Inclusion project together with link to the project portal. 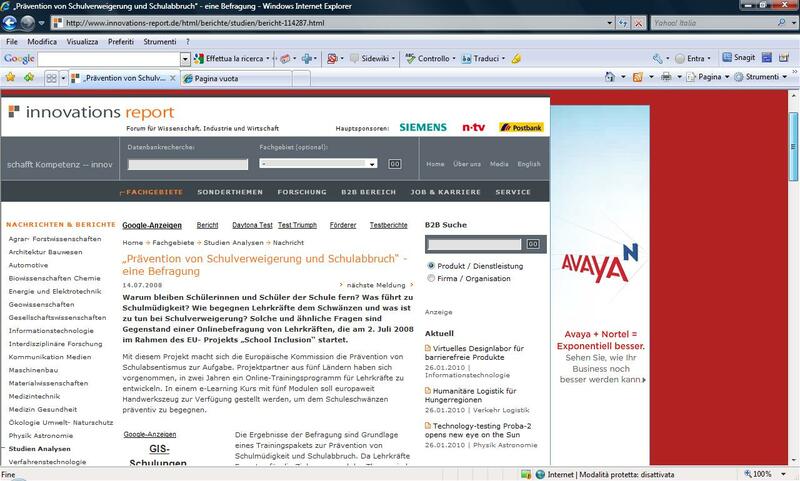 Teacher News German website of news for teachers. It contains an article about the School Inclusion project. 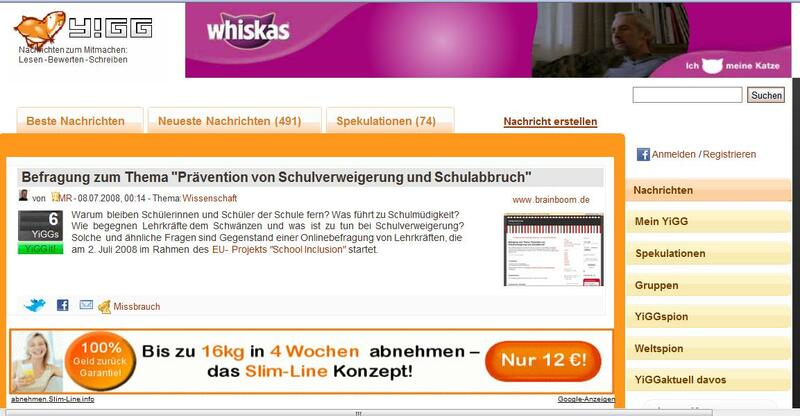 Innovations Report German web article about early school leaving. 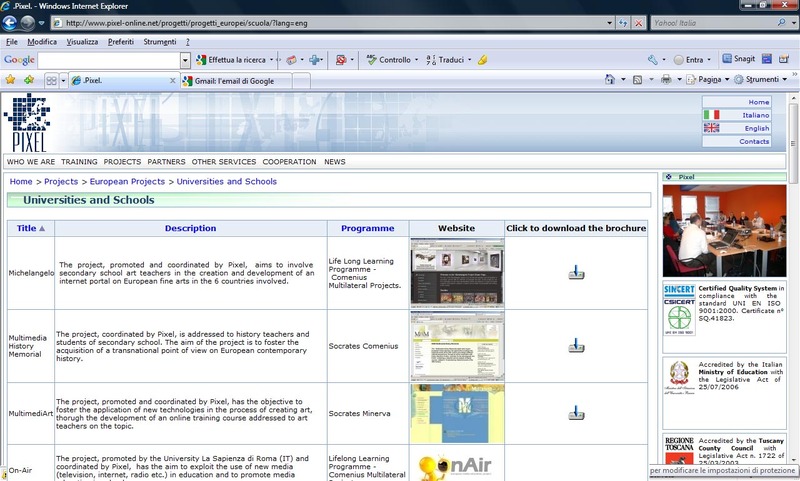 It refer to the School Inclusion project and contains link to the project portal. Medport Medport contains information of projectionists in the field of education and healthcare. 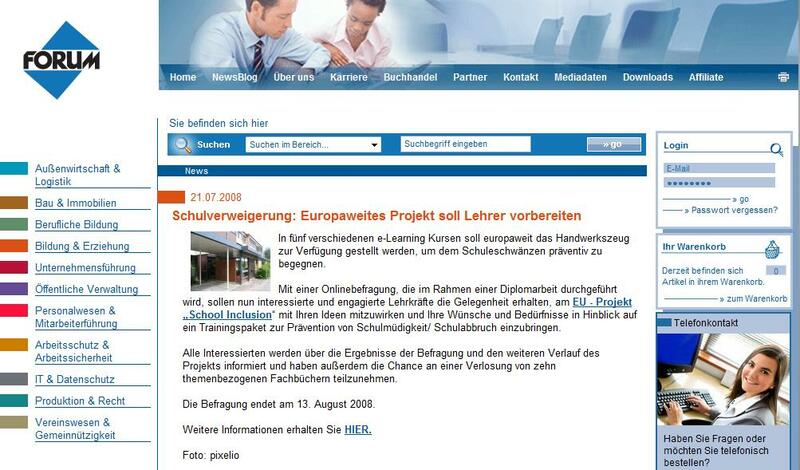 A web article refer to the School Inclusion project results. BildungsKlick Training and instruction website, it contains an article about early school leaving and the tools to fight it available on the School Inclusion portal. Forum Forum is a newsgroup with relevant information for trainers. The Forum website contains information about the School Inclusion project and a direct link to its portal. YIGG Yigg is a newsletter for teachers and educational institutes. 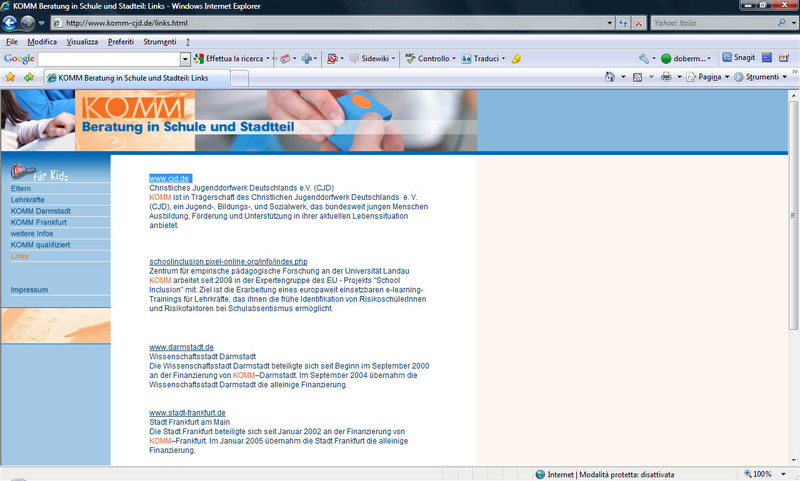 It contains a short description of the School Inclusion website and the link to the project portal. Sächsischer Bildungsserver Pädagogische Plattform, Information - Kommunikation - Kooperation (PäPIKK) is a pedagogic platform with e-learning and educative contents. 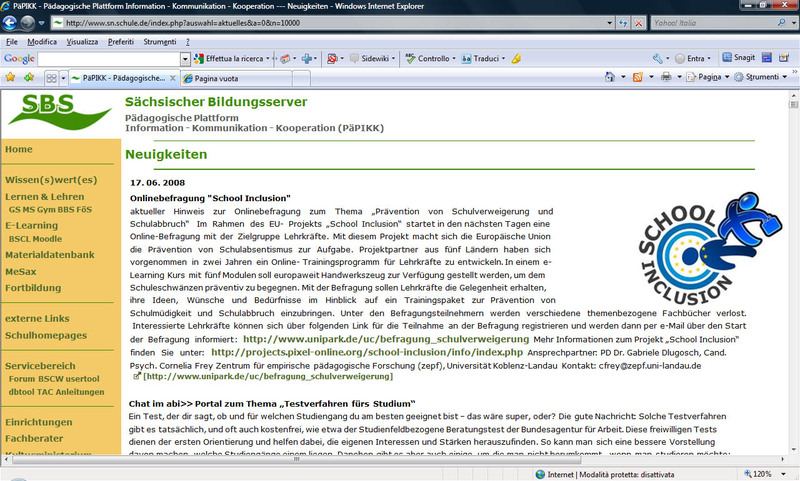 It contains information about the School Inclusion project.